Moving into care is often accompanied by negative feelings and a sense of loss of status.This is understood and taken into account by the staff here at Mellor Nook, to minimize as far as possible the loss of self-confidence and the failing sense of self-worth. Receiving intimate care in a new setting, often away from loved ones, especially at a time of adjusting to the 'home' as home, may be particularly difficult. Some people may resent their increased dependency, the need to receive care in a new and different environment and their reliance on staff. Their sense of loss may be similar to a feeling of bereavement. Staff are sensitive to these feelings and assist in helping enable residents to come to terms with their changing needs. For people with impaired memory and reasoning, the transition may be bewildering. Living in a home in no way diminishes residents' rights of access to health and rehabilitative services available in the community. This includes the right to choose his or her own GP and to see him or her in private. Managers & Deputies seek the consent of the resident, to be kept informed of any necessary changes in the resident's care. In the case of Mellor Nook, the rights of residents to have access to community nursing services are not diminished in any way. Mellor Nook has a right of access to available community resources and advice in the interests of their residents. The care provided at Mellor Nook is tailored to meet the needs (social, personal, or medical) of each individual. It is provided on the basis of an assessment that is both timely and comprehensive. At all times care is provided with respect and in a manner that is sensitive, maintaining the dignity of whoever is receiving care. The privacy of individuals, particularly in all matters dealing with intimate care-giving, is ensured at all times and their cultural and gender needs and sensitivities are always be recognized. Care is given by, or supervised by, skilled and trained people; training opportunities are provided for staff at all levels and are encouraged to take them up. The importance of early recognition of symptoms particularly mental health problems (for example, depression and dementia) cannot be overemphasized. The first essential is to ensure that the causes of any symptoms are diagnosed and any necessary treatment given. Many kinds of physical illness can give rise to an acute confused state, as can over-sedation or other inappropriate medication. Dementia is the condition that generally gives cause for most concern but depressive illness is very common in old age and can be mistaken for dementia. Delusional symptoms can develop in an otherwise intact personality. All these conditions can be cured or at least alleviated and the managers and senior staff at Mellor Nook take responsibility for seeing that no such illness is ignored. Junior staff are trained to recognise symptoms as they appear. The GP is always contacted at the first signs of any problems. Care giving is never coercive, and we always guard against risk of abuse and restraint. Nothing is done which makes individuals lose their self-esteem. Even at their most frail and vulnerable, individuals are helped to make choices about the care they receive. In April 2002 the National Care Standards Commission replaced the Registered Homes Act 1984 which made a distinction between residential care homes (in Part I) and nursing homes (in Part II). Under the Act, residential care homes provided accommodation and personal care while nursing homes provided care which required the skills of, or supervision by, a registered nurse. This in essence is still the case however now the distinction is solely in registration classification. In practice the differences are sometimes hard to define, particularly because of the changing needs that an individual may experience while remaining in the same setting. Some flexibility is given when taking into account fluctuations in residents' health. C.QC. will review the position periodically to determine whether changes in registration are required. Under this new Umbrella of “Care Home”, Mellor Nook ensures that any nursing care provided is under the control of a community nurse with an agreed protocol relating to named individuals within the home. Social support within Mellor Nook is the support which is provided to older people to enable them to function as social beings. 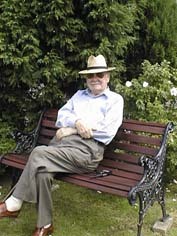 It includes social activities designed to enhance residents' sense of well-being, moral support, care and attention paid to ensure individuals can maintain contact with family and friends in the community, and making advice and advocacy available to help individuals deal with their personal, financial and legal affairs if desired. Attention to the spiritual needs of individuals is also important and care is taken to identify what those needs may be for particular individuals. 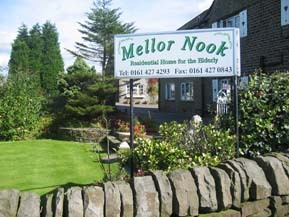 The provision of social support is an integral part of many of the daily activities at Mellor Nook. It forms an element in getting up, eating and drinking, being involved in social activities within the home, having spiritual needs attended to, getting around the building and garden, and going to bed. Other sections in this guide deal with these aspects in more detail. Staff are alert to the needs of residents and spend time listening to their views on what sort of activities they may wish to become involved in or stay away from. Personal care is the intimate tending of physical needs, which the individual finds difficult or impossible to do alone. Some sorts of personal care is given during the normal pattern of daily life helping a resident to get around, helping at mealtimes. Other aspects require privacy and sensitivity washing and bathing, going to the toilet. The individual are always able to choose where and when these activities are performed and are not subject to rigid routines. All equipment used is personal to the individual (flannels, soap, etc). Many of the functions categorised as nursing care are carried out under the supervision of a community nurse or the resident's GP (as would be the case if the resident were still living in his or her own home). The holistic approach that Mellor Nook uses looks to the needs of the whole individual. Following assessment of care needs, staff may work closely with individual residents, or seek advice on care delivered by others. Nursing involvement in the form of consultation with both community nurse and GP is essential for the overall assessment, monitoring and coordination of health care. · auditing of standards of care. On occasions nurses who have specialist expertise and experience will be required to attend residents who, for example, have cancer, diabetes, a psychiatric illness, challenging behaviour or who are dying. Agreements and protocols with local trusts ensure the availability of nurses in these situations. Medical care may be required on a regular or intermittent basis, either from a GP or specialist consultant after referral by a GP, depending on specific medical needs. Our close links with GPs are invaluable. Residents retain their own GPs if they wish, and they are willing, without feeling pressure to register with a local one who acts as the home's overall GP. However, in some cases, where the person's GP does not want to continue looking after the patient after entry into a home, this may be the only option. GPs involved in providing medical care and advice to residents in Mellor Nook have experience and proven interest in the care of older people. Protocols have been established with GPs and local hospital consultants for dealing with discharges from and admissions to hospital, clarifying the roles and responsibilities of all parties and for visiting residents at Mellor Nook. Staff from the local psychogeriatric service such as the consultant psychiatrist, the psychologist and the community psychiatric nurse (CPN) are very helpful in planning and reviewing the care and treatment of people with who may be developing dementia and depression. Health promotion advisors from the local health authority are involved in developing activity programmes for residents. Mellor Nook does not have qualified nursing staff so protocols have been agreed setting out arrangements for local community nursing services to be available for residents when they need nursing care. Clear lines of communication have been established which are known to all staff about when and how to call in community nursing services. Similar arrangements have been established with specialist nursing services (Incontinence, CPNs, or specialist nurses from the community nursing service for diabetes, for example) are also available to Mellor Nook. Staff at Mellor Nook take meticulous care over the administration of drugs. Only nominated and trained staff are involved in giving medication to residents. Procedures are in place to ensure the wrong drug is never administered. Some conditions, for example diabetes or Parkinson's Disease, require a strict drug routine which may not fit into the daily meal pattern. These routines are observed with care. Medicines are kept safely and locked away, with full records of their receipt, administration and disposal. Medicines are administered directly to the resident and a record is taken they are not transferred to open unnamed containers for distribution. If the medicine is not taken it is disposed of and accounted for in line with the C.Q.C. disposal of drugs policy. A common problem amongst residents is the large number of drugs (polypharmacy) which they are taking, often over a period of years without any proper review. Sometimes this leads to unwanted effects or unnecessary confusion. The use of sedatives and sleeping pills is sometimes prescribed as a matter of course. Drugs’ being prescribed from hospital without any proper feedback to the resident’s GP and vice versa may cause a problem. We try to eliminate this by the GP reviewing the medication on admission to the home and review it regularly thereafter every two or three months. Care plans for individual residents at Mellor Nook are to ensure that each resident receives the individual care he or she requires. They are a necessary part of the record-keeping of the home and facilitate good communication between residents and internal and external staff. Residents (and their relatives where appropriate) are encouraged to take a lead in saying how they would like to be looked after. Care plans are the basis for daily care and they are referred to regularly and updated as appropriate. They are available to relevant staff at all times. Consistency in their implementation is one of our most important concerns. Residents have direct access to them, at any time. Their permission is sought before people other than the responsible care staff can see them and use the information they contain. With the individual resident's permission, the care plan is used by inspectors as one means of checking on the quality of care provided at Mellor Nook. Care plans at Mellor Nook have been developed specifically for our residents and environment. The following areas are what have been taken into consideration. · specific assessments if not already completed are undertaken and included in the plan. · the plan is confidential and remains the property of the resident. We endeavour to make the Mellor Nook Care plans factual and jargon-free. The following areas are considered when writing up the care plans. · expressed wishes in relation to death and dying. Wherever possible, clear and attainable goals are set out in the care plan which the resident and care staff can follow on a planned basis, with a time-scale (which is not too far in the future) for achievement. In this way progress is monitored and incentives given to both resident and staff. It is Mellor Nook’s policy not to run a key worker system the reason for this is mainly the size of the home and the staffing constraints. All staff are able to have constant interaction with all residents at all times.